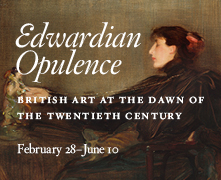 This one-day graduate student symposium considers the visual arts in Britain and its empire, America, and Continental Europe between 1901 and 1910—the era marked out by the reign of the British monarch Edward VII—in relation to the intersecting social, economic, sexual, political, and psychological tensions and anxieties of the period. The opening decade of the twentieth century is often perceived as a golden age of luxury, glamour, and relative social stability before the cataclysm of World War I. The historian George Dangerfield, investigating the “strange death of liberal England,” conversely argued in 1935 that it was also a period of crisis that saw, inter alia, an upsurge in militant trade unionism, the agitation for women’s suffrage, the origins of fascism, impending constitutional crisis, and imperial unrest. Similar tensions were felt across Europe and the Americas in this transitional period. The symposium will consider the ways in which the first decade of the twentieth century came to be interpreted as both a golden age and an age of anxiety and protest, and how the visual and material culture of the time registered ambivalent feelings about the state of society in Britain and beyond. The symposium coincides with the opening ofEdwardian Opulence: British Art at the Dawn of the Twentieth Century, the first major international exhibition in more than a generation devoted to surveying the full depth and breadth of the visual arts in Britain during the first decade of the twentieth century. The program will include the following papers by graduate students as well as breakout sessions in theEdwardian Opulence exhibition and Center’s collections.